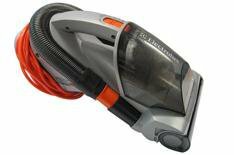 Electrolux Workzone stair and car vac | What Car? This cleaner provided massive suction power so much so, that the manufacturers have a two-speed setting so that you can have more gentle suction in areas that need careful cleaning. A cleaner hose allows you to reach tricky spots, while the rolling brush sweeps clean even the most ingrained grime in carpets. As the cleaner is essentially a scaled-down version of a traditional vacuum cleaner, it is intuitive to use. Despite its size, it is reasonably compact and does not feel too cumbersome. Unfortunately, though, it operates off a mains supply only, so you have to be close to home to use it. It's not cheap, but nor is it anywhere close to the most expensive cleaners tested here. It also doubles as a lightweight house cleaner, lending versatility. Online discounts were hard to find, though. It's a long way from being a design statement, but there's nothing fundamentally wrong with the cleaner's rugged grey plastic build. The hose sits conveniently within the base, while the power cable can be neatly wrapped around the base. A special nozzle helps you get the hose into crevices, while a lifting visor on the rolling carpet brush means you can also clean vertical surfaces without having to manoeuvre like Houdini.